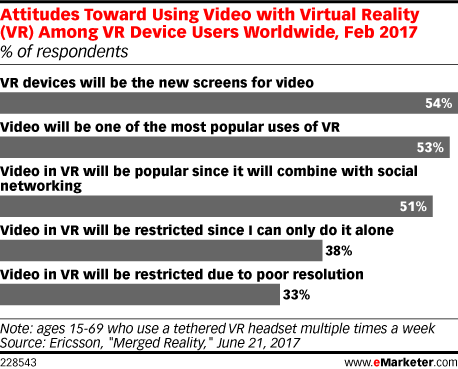 Data is from the June 2017 Ericsson report titled "Merged Reality." 9,200 smartphone users worldwide ages 15-69 were surveyed online during January-February 2017. Respondents had to be aware of the concept of virtual reality to take part in the survey. The survey encompassed 8 countries: France, Germany, Italy, Japan, South Korea, Spain, the UK and the US.